This question was in some slight fashion prompted by postings about booting into a 64 bit kernel. Of course not all applications are 32 / 64 bit switchable and iTunes [9.2.1] is actually meant to be usable on 10.4 upwards, so no surprise I guess as to its not having been made switchable at all. 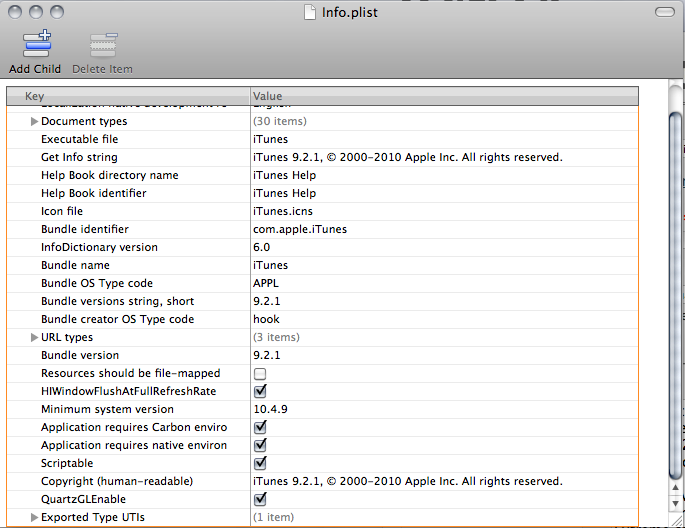 In the iTunes application's package contents one can find the Info.plist. QuartzGL enable, as previously stated, by default it is unflagged. I'm just beginning to run iTunes with this flagged in a re-edited Info.plist file that I authenticated into the application's package contents folder, so I shall post and advise. Just wondered if anyone else had seen this. & also what I have been missing by not having QuartzGL enabled. Thus far I haven't found much difference to speak off. That's interesting... I had kind of thought that the Viewer for quartzcompositions in iTunes was supplied by the Quartz Composer Visualizer.bundle in the iTunes plugin folder. Yes, I think you're absolutely right that full Quartz functionality for almost all QC comps protocolled as visualizers is given by the .bundle. Another one of those, "what difference does it make?" questions I think. I don't think this option is even relevant any more to be honest -- if you spot any non-trivial differences, I'd be interested to hear about them (I eat lunch with the people that wrote/maintain Quartz2D).